Some of the buildings are new, some are old. They each have (or had) unique uses, but all of them have character. 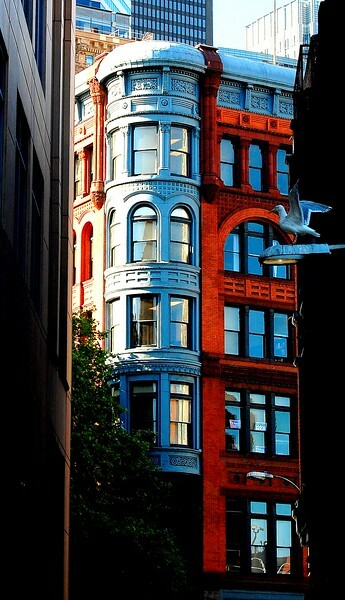 This is one of my favorite building shots - it is in Seattle & was just the coolest building. The sun was positioned just right on the left side. The right side of the building was in the perfect shade, so I thought the differences in light made the colors great. Minor PP in this shot - just a little sharpening, but no more. Yes - that's actually a real bird that had just landed on the light as I snapped the picture - I was especially pleased that the Seagull dropped into the scene.